Lots of people ask us for a new roof. They can see the shingles curling at the corners or have seen shingles in their front yard after a storm. They’ve put it off until they absolutely need a new roof, and they need one fast. But what exactly goes into a roof? Unless you’ve worked in the roofing industry or replaced an entire roof before, you may not know the details of a roofing system. That’s where we can help. We’ve been re-roofing homes for decades. We know how to vent your attic space to remove heat and moisture, how to add value and luxury to the look and feel of your roof, and how to guard vulnerable areas from water. And we do it with a total roofing system. A total roofing system combines lots of different elements together. Some houses have flat roofs, and some have high peaks or arches. Some have skylights. Some don’t. Really, no two roofs are alike. But everyone can know about their specific roof and learn the roofing terms the industry uses. It’ll help you feel more comfortable with buying a new roof, and make you a hit at neighborhood parties (well, maybe not). Skylights. It really begins with the end in mind. If you’re looking at having some natural light in your home, you need to think of it before the water barrier and shingles are laid in place. If you’re wondering what that would look like on your roof, ask for an estimate while our technicians are at your home. The costs for a new skylight are tiny compared to the cost of the roof as a whole. Plus, skylights are great for increasing the resale value of your home. Natural lighting brings added warmth and light to a room or an attic space. Self-Sealing Ice & Water Barrier. Water and ice are the elements that can damage your roof. They can contribute to wood rot and provide a place for mold and mildew to accumulate. That’s why having an ice and water barrier is important. Utah can have desert dry conditions in summer months and wind, hail, rain, sleet, or snow in winter months. Having a barrier helps to keep that moisture out protecting your roof and your home. Shingle Underlayment. Placed beneath the shingles, the underlayment protects your wood roof from the elements by sheeting anything the shingles don’t catch. Applied directly to the roof, underlayment is waterproof material that helps to protect your roof when excessive winds combine with heavy rains to blow in at irregular angles. If rain only fell straight down, it wouldn’t be as necessary. But rain blows whichever way the wind blows, so having protection at every angle is necessary. Roofing Vents. Proper ventilation can protect your roof from premature failing because it removes heat during hot weather and moisture during wet weather. Proper ventilation can help keep your home cooler in the summer, and when you combine it with proper insulation you can increase your energy efficiency in the winter months, too. Under-Eave Ventilation. Ridge vents keep air flow moving reducing the chance that moisture can build up and affect your roof and your home. Because heat rises, it’s important to keep that hot air flowing so it doesn’t build up high temperatures in parts of the roof. Ventilation in the under-eave can help keep that air flowing. Roofing Insulation. 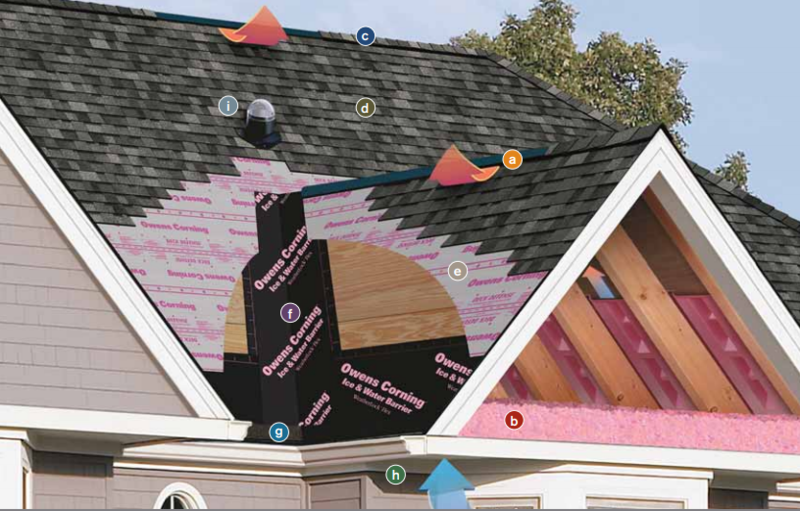 Insulation plays an integral role in moderating temperatures across your roof. It keeps hot and cold air in check by moderating gases, balances the effect of the sun and snow by transferring temperatures, and absorbs and releases condensation by eliminating air gaps. It protects your roof and your home in myriad ways, so ensuring attics and other rooftops structures have adequate insulation is significant. Starter Shingles. Starter shingles hang over the edge of your roof to create a drip edge where rain and snowmelt can flow into a rain gutter. It helps to keep the water off of the roof. Starter shingles also help to prevent shingle blow offs during intense wind storms, so installing them correctly is important. Roofing Shingles. This is what most people think of as a roof. The shingles. Shingles are the first line of defense against the elements. They reflect heat, repel rain, protect against hail and acorns, and are the most visible and prominent part of your roof. Hip & Ridge Shingles. Ridge ventilation and under-eave ventilation make the roof more efficient (see #5). To keep them looking as good as the rest of the roof, specific hip and ridge shingles are added to keep with the general look and feel of the rest of the roof. It helps to protect the ridge ventilation, and adds an attractive look to the finished product. Because so much can go into a roof, we work with homeowners like you to choose what works best for your roofing system. If you’re looking for a new roof, give us a chance to talk with you about what you’re looking for. We’ve got the most popular colors to help make your roof and home the envy of the neighborhood. Previous: Previous post: Asphalt or Metal: Which is Better for a Utah Roof? Next: Next post: Which Color Shingle is Best For My Home?